(a) Calculate the period of oscillation when the length ℓ = 1 m, assuming that the acceleration due to gravity at the place is 10 ms–2. Give reason for your answer. (c) The pendulum bob is taken out from liquid and is oscillated in air itself. Explain what modification you will make to halve the period of oscillation. (d) The centre of gravity of the bob is raised through a height of 6 cm from its mean position (lowest position) when the bob is in the extreme position during its oscillation. Calculate the speed of the bob when it crosses the mean position. 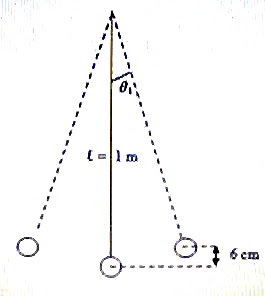 (e) Calculate the maximum angle through which the string can be displaced from the vertical so that the string will not break when the pendulum oscillates. Try to answer the above question which carries 15 points which can be distributed among the parts (a), (b), (c), (d) and (e) as 2+3+2+4+4. You can take about 17 minutes for answering the above question. I’ll be back with a model answer for your benefit shortly.